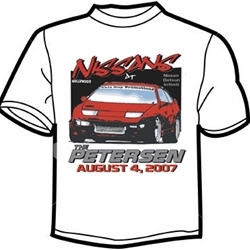 T-Shirt from the "Nissans at the Petersen" event at the Petersen Automotive Museum. Features a 300ZX Turbo with the Hollywood hills in the background. Gildan Heavy T. Design is on front of shirt.